Happy Hump Day! Hope the week is treating you well so far. Today I wanted to share something I've been reading lately - we can call it What I'm Reading Wednesday just for fun. For five years, I worked in a bookstore to pay my way through college, pay the bills basically. While the retail aspect wasn't glamorous by any means, it was a book lovers paradise. To say that I read a lot is an understatement. I read pretty much every evening before bed. I typically read fiction. It helps me decompress. Let's me think less. But, I do have my stacks of non-fiction books as well. Sometimes I'll read a few chapters of a fiction novel then switch to something else, something more educational. 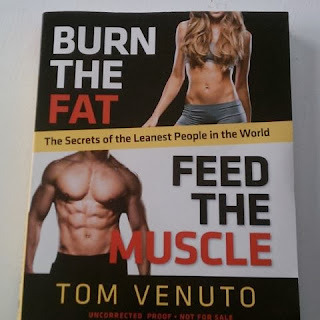 Lately, that has been Tom Venuto's latest book: Burn the Fat, Feed the Muscle: Transform Your Body Forever Using the Secrets of the Leanest People in the World. I was lucky enough to get an advanced copy to review (the book will be released in December). I was extremely excited about this opportunity. Jason and I bought his first book eons ago not really for weight loss, but to understand weight lifting really and nutrition. It was a great intro book for both of us in terms of understanding better nutrition and principals behind weight lifting. This was around the time when I was really starting to get serious about lifting and Jason was seriously into triathlon training. Long story short, I've been following Tom Venuto for a while now. What I love about this book and his approach in general, is that it's not about weight loss. I mean, it is, but that's not the focus. The focus is to build lean muscle and lose body fat. Yes. Finally talking about something other than numbers on a scale and slashing calories. This is my approach with my clients. I want them to forget about that arbitrary number they have in their minds about what they want their weight to be. I encourage them to focus on fat loss instead. We focus on building lean muscle through diet and exercise (resistance training and cardio). There is so much mis-information out there about weight loss. Most people assume you just cut your calories and voila! But it's not quite as simple as that. Tom goes into great detail explaining exactly why this dieting approach just won't work. I also really appreciate that he shows that that number on the scale doesn't always speak the truth. You can be your so-called ideal weight, but look flabby and soft. On the other end, you might weigh more, but look lean and tight. I think I'll go with weighing more and looking lean and tight. How about you? Much of what Tom talks about in his book, I learned going through the ISSA Fitness Training Certification courses. But, not everyone is a fitness trainer. I think most people gain information from magazines and web articles. I know I used to. However, there's so much out there that's either flat out wrong, misconstrued, overly hyped, and usually based on "the average person." Tom's book is very well written and very straight forward. He's been able to take some rather complicated information about how the body works, and make it understandable. He includes examples as well as formulas that you can use yourself to accurately calculate things like your caloric needs. And while the cover shows ripped abs and cut muscles, don't let that scare you off. This book is honestly ideal for everyone. It's got some great information. And it's broken down neatly by chapters taking each piece of the puzzle then slowly adding it all together so it makes sense as a complete program. You'll learn why you should focus on fat loss vs weight loss. You'll learn about proper nutrition and macro nutrient breakdowns as well as resistance and cardio training. I know that sounds complicated and tedious. But, it'll start to all sound less complicated as you read through each chapter. Even as a fitness trainer, I had "ah ha" moments. My copy is already highlighted like a college textbook! Another important thing that he shares is something I've been noticing - habits. For him, he's sharing habits of people who are fit and lean. Some of those things include eating vegetables, getting enough sleep, drinking enough water. They sound like simple things, but so many people aren't getting enough sleep, aren't eating veggies or drinking water. Diets are so high in sodium, sugars, refined carbs. I think it's important to see the habits of successful people. To know and understand what they're doing right. Honestly, if I could, I'd buy this book for all of my clients. I would highly recommend this book to anyone looking to get fitter, healthier, smarter. Note - this book was sent to me to review. I was not compensated for this review. Any opinions expressed are my own.